Downtown Chattanooga posted what may be its biggest private sale ever last month when Atlanta-based The Simpson Organization paid $36.9 million for Warehouse Row. The purchase price for the Market Street facility was nearly triple the amount that the property's former owners, Jamestown Properties, paid only a decade ago when the complex was struggling to find retail or office tenants. Downtown experts said the jump in price at Warehouse Row reflects both the upgrade of the 260,000-square-foot row of buildings and the overall growing appeal of Chattanooga's central city. They said downtown is attracting more attention than the city has seen in decades, even as values go up. Henry Glascock, an appraiser and commercial real estate agent for John Dixon and Associates, said a recent auction of other downtown properties drew potential investors from New York and other cities who flew to Chattanooga to check out the property. "I was blown away by it," Glascock said. David DeVaney, president of NAI Charter Real Estate Corp., said investors are showing a belief in the vision and viability of downtown. "Attracting large institutional investors is good," said DeVaney, who said there have been more downtown office buildings change hands in Chattanooga during the past two years than in the prior decade combined. A surge of new housing downtown is helping woo both in-town and out-of-the-city investors. That, in turn, is attracting retail back to the central city. "If additional residences are added downtown, that will create enough demand for retail," said John Healy of Sperry Van Ness/Elder Healy commercial real estate firm. "I think the trend will continue." Last year, two residential properties on Williams Street just a block from the Chattanooga Choo Choo sold for more than $2 million each. Increased amenities and housing will also boost demand for offices, Healy said. "It creates a healthier environment for retail and residential," he said. Glascock said that when a large investor such as The Simpson Organization, which has 90 properties, pays the kind of money for Warehouse Row that it did, the company does a lot of research. They're confident retailers can pay the rents needed to support the sale, he said. "It all ties together," Glascock said. Another element to downtown's growth is that a lot of younger people are interested in the city's core, he said. "They see the world differently," Glascock said. "All the stars are lining up." Kim White, chief of the nonprofit redevelopment group River City Co., said the Warehouse Row sale should give a lot of people confidence in the central city. She estimated there's probably $50 million in new developments popping up downtown. "We're really on the upswing," White said. A dozen years ago, Warehouse Row on Market Street was in distress. The former outlet mall was 20 percent occupied and the property was looking a little forlorn. When the Great Recession hit, the value of other downtown properties also dropped. Plans for a major project on the 700 block announced more than a decade ago failed to get off the ground, and only now is the site being developed. Five years ago, TVA repurchased its 1.2-million-square-foot Chattanooga Office Complex for a mere $22 million — a fraction of the $160 million spent to build the facility in 1986 and only $18 per square foot. The 177,020-square-foot Gold Building once used as the headquarters of BlueCross BlueShield of Tennessee on Chestnut Street was acquired by Ken Defoor in the recession for only $6.1 million, or $35 per square foot. Jamestown Properties, which has offices in Atlanta and New York, paid $14 million for the 260,000-square-foot collection of warehouses in 2006, or less than $54 per square foot. Jamestown plowed an estimated $20 million into the site and repositioned it, attracting new restaurants and some national retailers back to downtown. Today, the retail space is about 90 percent occupied, while its offices are some 85 percent leased. 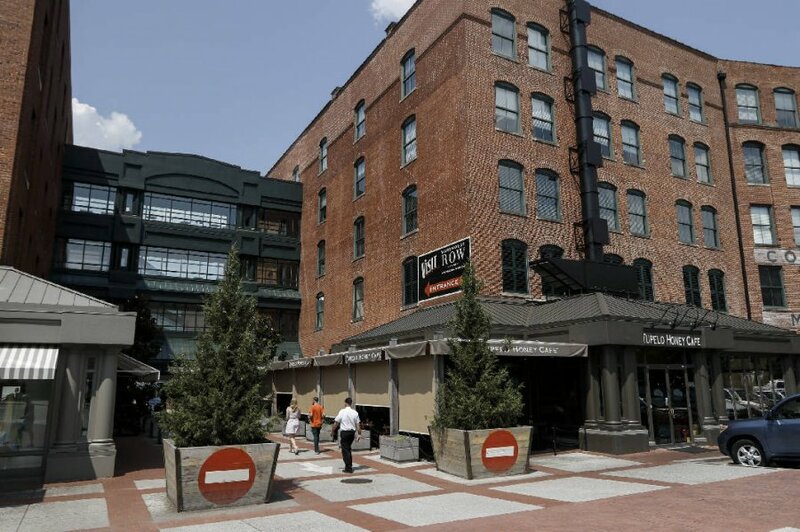 Simpson bought Warehouse Row, which also includes a nearby parking deck, for the equivalent of nearly $142 per square foot. The Simpson Organization also showed its confidence in Chattanooga's downtown market in December when it broke ground on a 10-story apartment building in the long-vacant 700 block of Market Street — four blocks from Warehouse Row. Work has begun to erect the 125-unit apartment complex that will also have office and retail space. Simpson said that $30 million project, which will be the tallest structure built downtown in three decades, sits next to the 18-story SunTrust Bank Building his group also owns. When the apartment building is finished around early 2017, The Simpson Organization may become the single largest private building owner downtown, with 547,021 square feet of space — surpassing Republic Parking and Luken Holdings. TVA holds nearly 2 million square feet in the central city. Boyd Simpson, who heads the Atlanta group, cited the urban redevelopment going on downtown, with a hot apartment market helping drive plans for more than 2,000 residential units potentially coming online in the next couple of years. "We like Chattanooga, particularly the urban element of Chattanooga. ... We think the city is on the right track," Simpson said. "We'd like to be a part of it." Contact Mike Pare at mpare@timesfreepress.com or 423-757-6318.